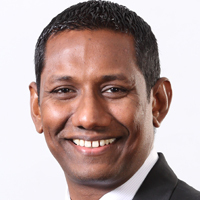 Bimal currently serves as the Chief Risk Officer of LB Finance PLC, a leading Non-Bank Financier in Sri Lanka. Previously he worked for Allianz Insurance, heading Risk management and Planning departments of its Sri Lankan subsidiary. During the period from 2004-2011 he held several senior management positions in blue chip conglomerates in Sri Lanka and overseas specializing in the areas of Corporate Treasury and Strategic Finance. During his tenure as a Corporate Treasurer he has excelled in design and development of effective hedging strategies for managing foreign currency risk and interest rate risk. Whilst historically, Corporate Treasurers have only been responsible for their firm’s core funding activities, their ability to add value to the firm was limited. But now, as the business environment has become more complex, some firms and their treasuries have evolved as more and more activities become centralized within the Treasury operations. When operating in a fragile macro-economic environment; you are always faced with the uncertainty of local liquidity drying up. A Corporate Treasury plays a pivotal role in mitigating funding liquidity risk by defining a strategic funding mix for the firm by exploring multiple funding avenues when faced with a sudden liquidity crunch. While a more traditional approach to funding would overly rely on banks, a specialized treasury unit is capable of exploiting other avenues available for funding such as debentures, commercial papers, securitizations and loan syndications. As long as you have debt financing in your balance sheet, you will be exposed to interest rate risk. Your Board may have instructed you to minimize market interest rate risk, but you certainly don’t want to be caught up at the wrong end of the yield curve by fixing at the peak. A decision on fixing interest rates may depend on the timing as well as your outlook for future interest rates. If your lenders are not offering you fixed rate loans, your Corporate Treasury should be able to explore other options that are available to you. Some of these options would include purchasing synthetic interest rate protection and interest rate swaps in order to hedge your exposure. In order to gain maximum benefit from such measures your Treasurer needs to have the technical know-how to evaluate the pricing and cost benefits of an interest rate swap. If you are involved in international trade, your most significant financial risk is the management of foreign currency risk. As an exporter you would want to make sure you optimize foreign exchange revenue flows to give you that extra 1% margin over your competitors. With this in mind, selling forward your cash flows or holding onto them can be a crucial decision. If you do decide to sell, determining what percentage of your revenue you should sell forward would be also of utmost importance. While forward sales may eliminate exchange rate uncertainty, you may be missing an opportunity to benefit from favourable currency movements, so making sure you hedge downside risk and still keep an option to gain on the upside is a fine balancing act. Possessing the right financial instruments capable of offering you such solutions would give you a definite edge over the competition. These are some intriguing areas for any CEO/CFO to consider and you would want to make sure the people in charge of your Corporate Treasury functions have the necessary skills to advise your firm on the best course of action. A Treasurer can look at a firm’s cash either transactionally or holistically. The key advantages of a Holistic approach to cash management are a complete view of bank balances, short-term liquidity needs (through A/P or A/R, for example) and long-term cash forecasts allowing for optimization of banking relationships and enhancement of return on cash through cash pooling using netting or sweeping arrangements to minimize the usage of overdraft/working capital facilities. The Corporate Treasury can also be the central point for managing relationships with banks and other lending agencies. Banking relationships can be optimized across the business segments allowing for central management of bank-to-bank payments to increase the controllership over these transactions. Having a skilled specialized team gives the organization an edge in negotiating for improving credit terms, optimizing credit facilities and collaterization arrangements leading to reduction in finance cost. Most CEOs consider having a dedicated Corporate Treasury unit as an additional cost centre on a long list of overheads. However what they overlook is the magnitude of cost savings a Corporate Treasury could bring by having effective hedging strategies in place to manage your interest rate and foreign exchange exposures. The real savings could far outweigh the cost of having a specialized Corporate Treasury team armed with the necessary skill set.